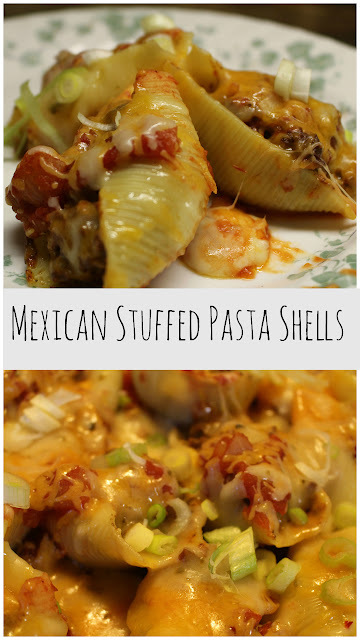 Tacos stuffed into pasta shells. This is one of my absolute favorite things to make (and eat, of course). It is actually fairly simple to make and they taste great. What's even best about these shells is that they make perfect left-overs...so lunchtime will be easy and taste just as good as when you made them originally. After trying them for the first time, the hubs requested I make them again soon.Which is odd, because he isn't a pasta eater, at all. So that's how I knew this is a keeper! Since then, I have made these several times. I just can't get enough of them! They seriously whip up super quickly. The hardest and longest part is just boiling the pasta shells! If you want to spice things up a bit more, use some taco sauce in lieu of just salsa. Don't forget the green onions! Altogether this takes less than hour to boil, stuff and bake the shells. I like to make sure the shells are a bit al dente when I boil them, otherwise they tend to harden while baking in the oven. I mean, cheese just makes everything way better. So why skimp on the good stuff? There is no reason to! I usually boil at least 24 jumbo shells, due to many breaking or because my daughter likes to snack on them while I am stuffing them. The choice is yours, but extra is always a good call! Prepare shells in boiling water according to package directions. Brown ground beef in a frying pan with taco seasoning. Drain beef; add cream cheese, cover, and let simmer until cheese is melted. In a 9x13 baking dish, spread half of the salsa out over the bottom. Spoon a tablespoon of the beef mixture into each shell. Place into the baking dish over the salsa. After all shells are filled, top with remaining salsa and cover with foil. Bake for 30 minutes; then remove foil, spread shredded cheese evenly over the top and continue baking another 15 minutes until all cheese is melted. Remove from oven, serve with green onions and sour cream; if desired.